WHAT MAKES RUNNING FUNKY UNIQUE FROM ALL THE REST? We have Half & Half Tights, Capris, and Shorts. You can pick whatever two fabrics your heart desires and that makes your pair of Running Funkies unique to your personality. Need extra length, No Problem! Need less length. We can do that too! Want a patch pocket on the outside of your leg? We can add a drawstring too, if that's your thing. We will order special fabric just for your team and work with your team colors! Want one short leg and one long? Have a themed run that you need a cosyume? We do that too! Have an idea for something different, we'll work with you. If it is something we can do, we don't charge extra for custom work and we do alterations for FREE! WHO ELSE DOES THAT! TREVOR PARKS is an annual competitor on American Ninja Warrior. He has been customizing his tights for competition for the past few years. He buys the tights for their performance and their unique funky patterns that grabs the attention of millions watching on TV. Last year Trevor ordered half & half tights with Green lightning and orange lightning. He looked awesome besides his mad skill through the course. Check out last years creation and stay tuned this spring to see the awesome patterns we put together to match his two different colored shoes and larger than life personality! WE SPECIALIZE IN TEAM ORDERS. 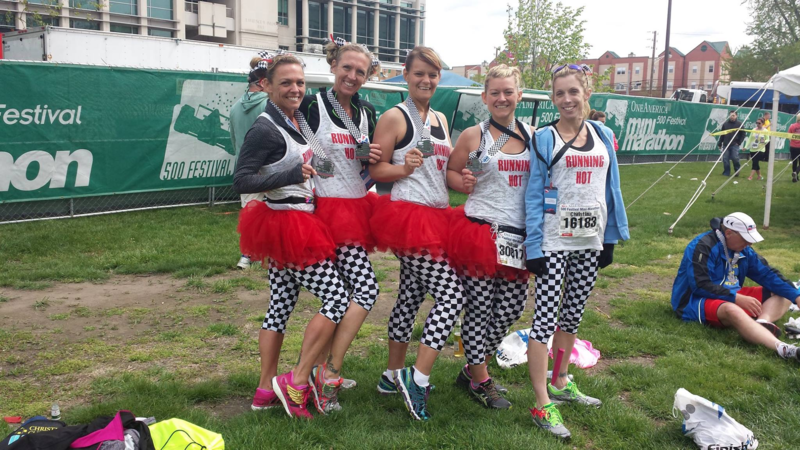 WE HAVE DONE THEM FOR SCHOOL TEAMS, MUD RUNS, FRIENDS THAT MARATHON TOGETHER AND MORE.